This peak is a western spur of Keeper Hill. Boolatin Top is the 767th highest place in Ireland. 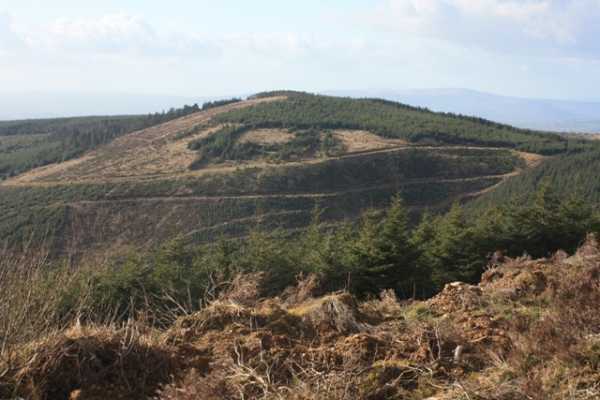 Boolatin Top is easily accessible from the Ballyhourigan Woods car park at R78464 66609 A on OSI sheet 59. Follow the forest track for about 2.3 kms, ignoring two left hand tracks, until you reach a junction at R80585 66339 B. Look out for the wide forest ride running up to your right just before the junction. 10 easy minutes walking up this rough ground will bring you to a cleared area, with the ‘high point’ probably just to the left at R80313 66189 C. The close forestry affects the views somewhat, but the summit of Keeper Hill is visible just 2kms to the east. Further away to the north west Tountinna is visible with its commanding position above Lough Derg. The Slieve Bernagh group, including Moylussa are also clearly visible on a good day to the west.